The Toronto Dingos made the trek across the 401 to face the Grand River Gargoyles in a huge match for both clubs with important playoff implications. Both teams needed a victory to cement their finals hopes as each club was neck in neck on the ladder for the final few spots. The match started slowly for the Dingos as the Gargoyles used the home field advantage to get the jump on the Dingos. The Gargoyles put up 4.1.25 to the Dingos 2.4.16 to go into the first break with a handy lead. In the second quarter, the Dingos found their legs and began to hit the scoreboard regularly. Lynden Evers battled strongly in the ruck, nullifying his opponent and creating plenty of ball use for the midfield. Michael Ladd ran all day in his second game as acting captain and the Dingos entered the half time break with a lead of 5.3.36 to 4.2.26.
defence. At the end of the third quarter, the Dingos held a slim lead 8.8.56 to 7.3.45. In the last term, the Dingos put the game away. Greg Gilbert took mark after mark in defence and nullified his opponent. It was an impressive display for Gilbert who continues to improve and is now a key member of the Dingos defence. Justin Powick was also devastating in defence creating offence from the half-back line. Dan Gunn ran out the game in the midfield and showed his usual elite running capabilities. When the final siren went off, the Dingos were victorious 12.11.83 to 8.4.52. It was a must win for the Dingos and they delivered, despite the slow start. 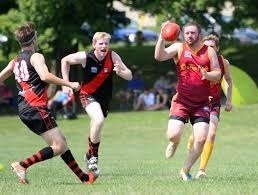 The Dingos now look to the remainder of the season to cement their finals chances.